Vegetarians are not winning in the public consciousness but they are certainly winning in media and academia. The reason is simple: claiming something is harmful is a great call to action whereas telling people they are healthier in the modern world than ever before won't raise money at all. The controversial group International Agency for Research on Cancer, which has been shown to have been hijacked by activists who didn't declare conflicts of interest, declared red and processed meat carcinogens on the same level as mustard gas, plutonium and cigarette smoking, and since California is required by law to automatically put IARC ingredients on its Proposition 65, there has been a rush to chase grants reaffirming why they are right. A new study in the Journal of Hepatology jumps on the Type 2 Diabetes bandwagon by adding non-alcoholic fatty liver disease (NAFLD) to the list of things to blame on a normal human diet. In order to create the association of type of meat and cooking method with NAFLD and insulin resistance, investigators undertook a cross-sectional study among individuals 40-70 years old who underwent screening colonoscopy at the Department of Gastroenterology and Hepatology in the Tel Aviv Medical Center, and who agreed to participate in a metabolic and hepatic screening study between 2013 and 2015. Like all observational studies, the confounders are numerous but the press release will be enough for groups selling fad diets, corporate science journalists, and anti-meat activists who won't note that the results need to be confirmed in prospective studies. The concluded that high consumption of red and processed meat is independently associated with NAFLD and insulin resistance regardless of saturated fat and cholesterol intake and other risk factors such as BMI. 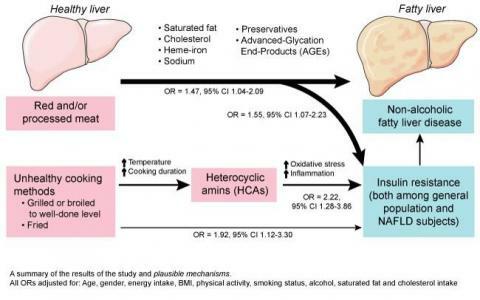 In addition, individuals who consumed large quantities of meat cooked using unhealthy methods and those already diagnosed with NAFLD who consumed high HCAs had a higher chance of having insulin resistance.